At the front of the Norton Museum of Art is artist Claes Oldenburg's "Typewriter Eraser," a key symbol of the Museum. A new stairwell at the Norton Museum of Art. The exhibition RAW (Recognition of Art by Women) by New York City artist Nina Chanel Abney. The Oculus, above the renovated auditorium, marks the intersection of axes of the building. The 80 years-old banyan tree at the new entrance is considered by the designers as "the soul" of the new Museum building. The Norton Museum now has a sculpture garden where visitors can walk and interact. It's the first of its kind for the arquictect of the project, Sir Norman Foster. 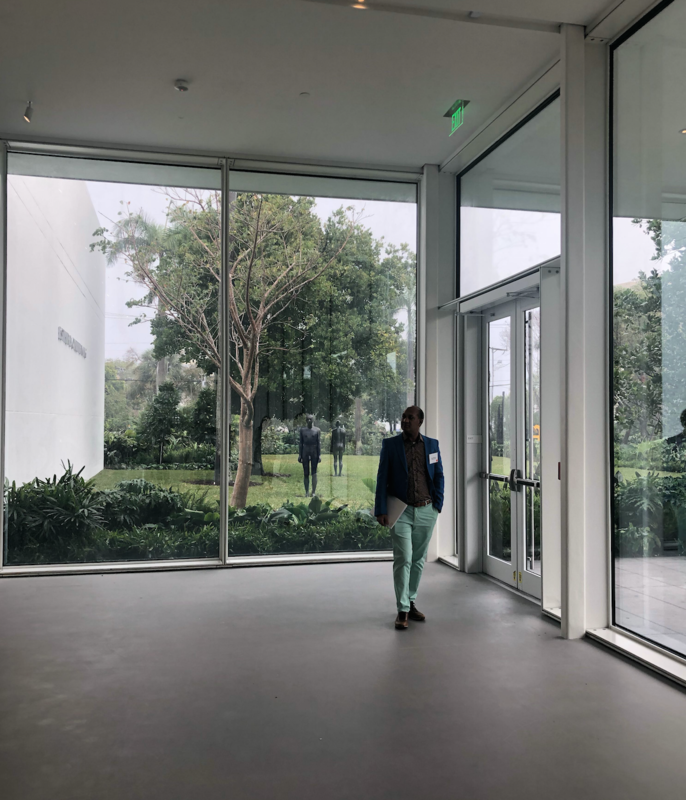 After eight years of construction, the newly renovated Norton Museum of Art in West Palm Beach will have its grand opening Saturday, Feb. 9. The $100 million renovation was done by Foster + Partners, the award-winning British architectural design and engineering firm led by esteemed architect Lord Norman Foster. The museum was origianlly built in 1941 to house the art collection of the industrialist Ralph Hubbard Norton. It's known for it’s massive contemporary art galleries and exhibitions; new additions include a transparent entrance lobby, an additional 12,000 square feet of gallery space, a restaurant, an educational center and a maze garden. The Sundial team went to the museum last Friday and spoke to Hope Alswang, the museum’s executive director and CEO. She discussed the museum's transformation. Listen to our interview with Hope Alswang, the Executive Director of the Norton Museum of Art. WLRN: What was that process like and how long did it take to get to be able to do the construction? ALSWANG: It was an eight-year process and I guess within the first 18 months I realized that we would probably be in a really major capital campaign and be doing a very large project. The Fosters + Partners' master plan wasn't complete so it wasn't clear to me how large the intervention would be. The project exceeded my expectations and I think a lot of board members were really surprised when we started to talk about a really large [amount of money]. That was really a huge issue -- to figure out how we could afford it. Tell us how much you had to raise. We had to raise $100 million. I think it's probably the most raised for a cultural institution in Palm Beach County. So [it was] a lot of money to raise and in the beginning we did not have large gifts. But then about a year and a half ago, Ken Griffin, who is going to be building on Palm Beach Island, came to our attention and we started to get to know him. He fundamentally made the end of the campaign by giving us $20 million. But yes, I'm still raising money. I never stop raising money. What was the significance of getting Lord Norman Foster as the architect for this? One of our board members had worked with him extensively in the big Hearst Tower in Manhattan and so we were able to get access to him. Because we had a board member who was very close to Norman Foster we got tremendous attention immediately and they started saying [our next step should be] to understand our needs and make a master plan. The first 18 months was really [to make] a master plan to address the things that we asked for - like a really good auditorium, like better facilities for our schoolchildren and more significant gallery space. All of those things had been on our wish list and once they started looking at that they gave us a fantastic master plan. What was it like working with him and how much did you get to work with him? I think we saw Norman actually in person probably every three or four months in London. I worked with his architects here on the ground a lot. We worked with the lead partner on the project and we would go to London and we would do reviews with Norman. He would come in and we would basically critique to the place that we had gotten to and he would offer pretty significant alterations and suggestions and we would go through. It was usually a two day process so in the beginning I was going to London every six weeks. There's probably ten major architects internationally and Foster is one of them. A lot of them do really outstanding work, but the thing that I think defines Norman Foster and the way in which he approached our project is that he loves art. This is not true of all architects. A lot of architects like art fine, but for Norman who is himself a collector, he understood our project and what our curators needed to make the very best place to show art. That's because he really, really engages in the dialogue of the building and the art. Watch WLRN’s Digital Director Teresa Frontado talk with architect Lord Norman Foster. Each year, the Norton Museum of Art in West Palm Beach chooses an artist to be showcased in its RAW (Recognition of Art by Women) program. This year, the spotlight shines on Njideka Akunyili Crosby.